An Ethiopian Airline has crashed, killing all 157 people on board. 157 people have been confirmed to be dead after an Ethiopian Airlines flight crashed shortly after takeoff. The incident occurred on Sunday from Ethiopia’s capital, Addis Ababa. Amongst the 157 dead eight Americans lost were among the lost reported by USA Today. 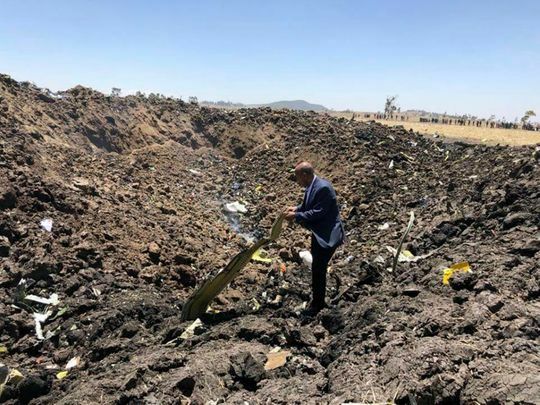 Ethiopian Airlines CEO, Tewolde GebreMariam standing amongst the wreckage, surveying the scene. The fairly new 4 month old Boeing 737-8 MAX plane crashed at 8:44 AM local time. The plane crashed six minutes into its flight towards Nairobi, Kenya 31 miles south of Addis Ababa. The pilot sent out a distress call and was given clearance to return. The cause of the crash is currently unknown. .
Other than the 8 Americans mentioned, 35 different countries experienced loss, including 35 Kenyans, 18 Canadians, and eight crew members the airline stated. At least one person killed was carrying a UN passport, and the U.N. World Food Program confirmed that multiple staffers were those amongst the dead. The plane operated by Ethiopian Airlines had routine maintenance Feb. 4 and had flown 1,200 hours. And the pilot had nine years of seniority with the airline. Overall, the airline’s safety record had been on par with other major world airlines. “I came to the airport to receive my brother, but I have been told there is a problem. I just pray that he is safe or he was not on it.” Said Agnes Muilu, a worried family member awaiting to hear the news. Boeing issued a statement saying it was “deeply saddened” to hear of the crash and a technical team was ready to assist at the request of the N.T.S.B. (U.S. National Transportation Safety Board). Although the Ethiopian Civil Aviation Authority are the ones leading the investigation, the NTSB is sending four investigators to Ethiopia spokesman Eric Weiss said.